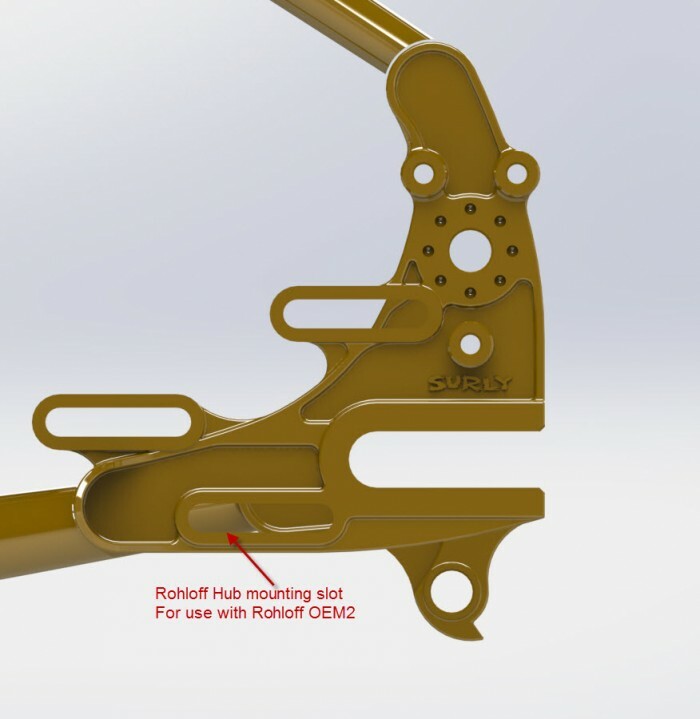 One of the basic structural supports of the Surly Way is taking stuff with you on your bike. What different people call that process varys widely depending on a where it happens and why. It's touring, bikepacking, commuting, adventurneering, beersploring, hauling, riding to Grandma's for Sundee brunch with a thermos of bloodies and a spiral-cut ham - whatever you call it is cool. We try to design things that help you get there and do that. For a good while now, the Surly Ogre has been one bike that can help you do all of those things and more. Today we get to show you a new updated version of it and get down to some brass tacks on why we did it. This gem gets a real similar treatment to what the Troll received a few months back - new dropouts, a non-suspension corrected geometry, a boef-ed up tire clearance, a new handlebar, and some other sundry bits. For the purposes of explanings, we'll enlist the support of Slippers Cortez - an engineer who puts the "man" in mandolin, and one of the authors of this bike's new features. Let's make it a question and answer sesh, shall we? Slippers? Thanks, Skip. Let's get right at it and get in front of some questions we think may arise about the Ogre updates. How is the new Ogre’s geometry/handling different than the Ogre I already have, want, have seen? In short, it’s not a groundbreaking change. The main changes are a shorter, non-suspension corrected fork, longer chainstays and some sizing shakeups. The Small, Medium and large frames remained relatively unchanged in ETT, stack and reach. The XXL and XL frames have been mashed into one size - a little longer and taller than the old XL and a little shorter than the old XXL. It fits Sov and he's 6'6". Just like the new Troll, the updated Ogre is built around the new Troll dropout and 12mm x 145mm Surly Gnot-Boost spacing. This allows the use of either 12 x 142mm thru axle hubs or 12 x 148mm Boost thru axle hubs. By using Surly 10/12 Adapter Washers you can also run 10 x 135mm bolt on or 135mm QR hubs. The dropouts maintain the ability to concurrently run a rack, fenders, a trailer, and a Rohloff hub if you so choose. We also increased the welding surface area on the new Troll dropouts to provide an even stronger weld interface than the legacy design. Can I run a 27.5+ Dirt Wizard on my blah blah blah…. Can I run a suspension fork? Nope, we have other bikes that can run a suspension fork and still include all sorts of braze-ons for your suspension aided bikepacking and touring needs. This rig is a dedicated rigid off-road touring machine. Yep, the Ogre will come stock with the Surly Moloko bar. Get ready to put your hands in a lot of positions. We like it a lot. Did the brake situation change? 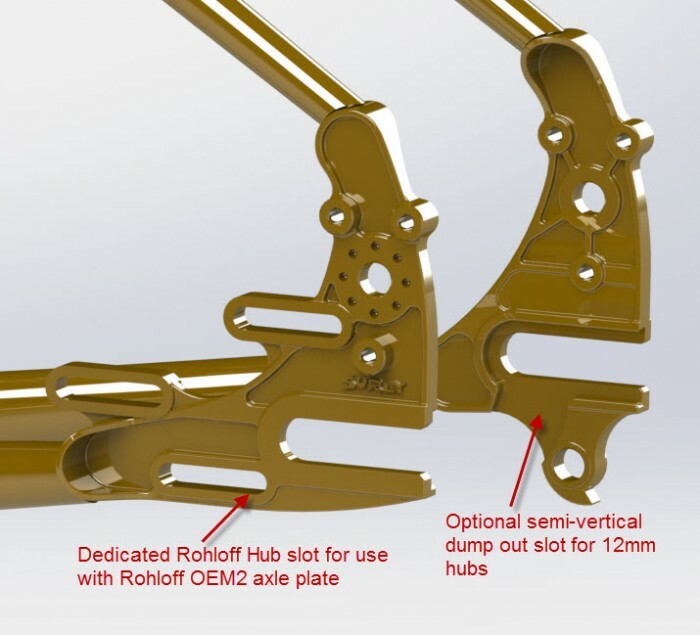 Nope, you can still run disc brakes or cantilever/V-brakes with the included canti studs. (They will only work, by the way, with 29" "normal width" rims - cantis and v-brakes won't work with 27.5+ wheel options given the with of the rim and the different position of the brake surface.) If you don’t want them just thread them out or mount a light there. Hell, you could run both if you wanted. Just kidding….kind of. If you’re using 27.5+ tires we recommend installing the wheel with the tire deflated to pass through the canti bosses. We would hate for you to tear your sidewall just before you set off on your tour. Tubeless ready on the complete bike? Yes, the ET tires that come stock have the Surly Tubeless Ready Bead and the stock rims are tubeless ready as well. What other a accessory barnacles come standard? Just about every one imaginable. 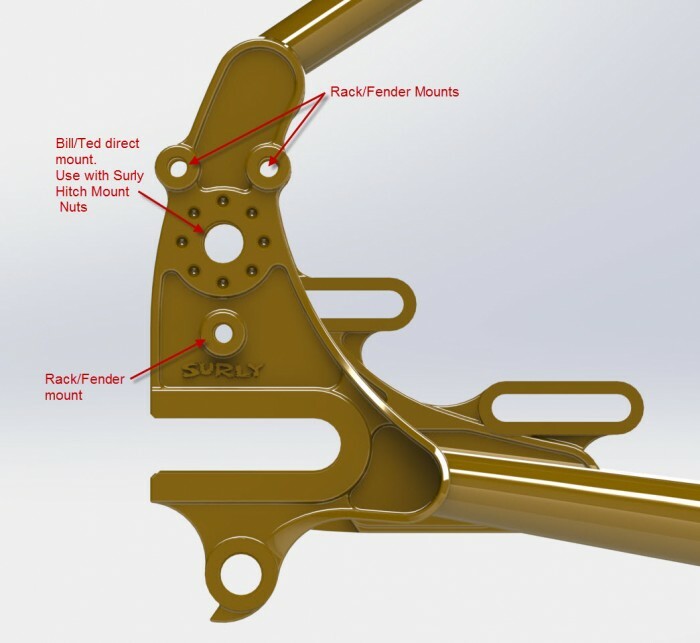 The fork includes lower and upper barrel bosses and dropout mounts for fenders, racks and low-rider type pannier racks. The fork also has four sets of triple bottle mounts that allow the use of 4 bottles, 2 anything cages and 2 bottles, or whatever other fork mounted devices you can imagine. 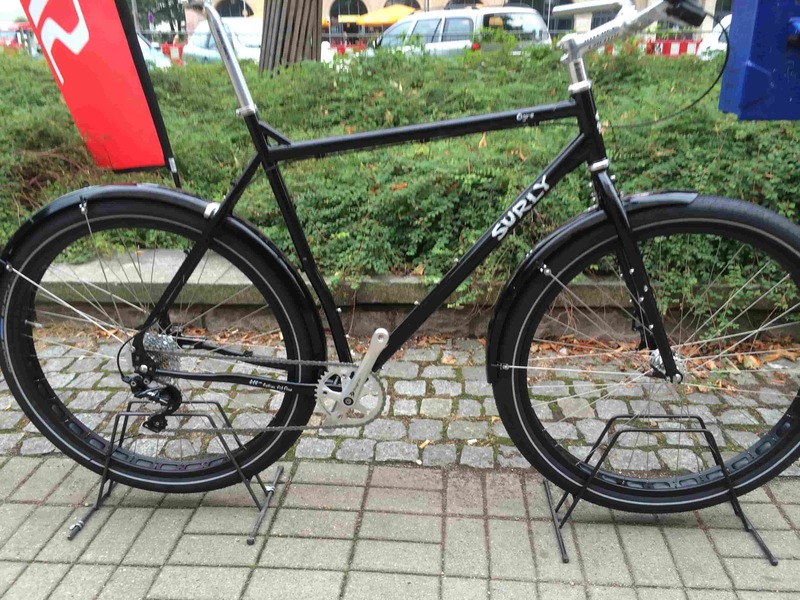 The frame features Surly Trip-Guides for full length external cable routing. The triple guides on the chainstays were canted outboard to allow for more convenient Rohloff and other IGH cable routing. Don’t fear, there is still plenty of heel clearance. The Frame also includes triple bottle mounts on the top and bottom of the downtube, and a seat tube water bottle mount (the Small frame does not have a seat tube bottle mount). 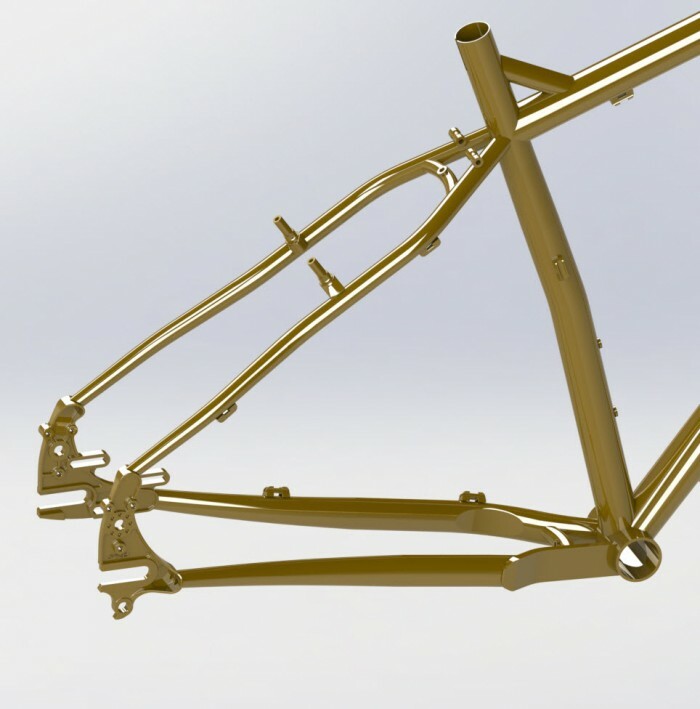 To finish it off, the rear end of the frame has barrel bosses on the seatstays, and seatstay and chainstay bridge mounts for fenders. Any other geometry and handling changes? The additional clearance for 27.5+ tires does create a few potential geometry changes. Although the outer diameter of a 29 x 2.4 or 2.5” and 27.5 x 3” tire is close, they aren’t exactly the same. Running 27.5+ tires will lower the bottom bracket height by approximately 7-10mm, but will still remain in the 300mm range. Plenty of BB clearance for off road touring. When redesigning the fork and frame a big consideration was to maintain the handling characteristics that the Ogre is known for. Therefore, the trail numbers, BB drop, BB height, headtube angle and seat tube angle remain very similar to the legacy Ogre. The chainstays were lengthened about 10mm to improve stability and provide more clearance if you decide to tour with panniers. The wheelbase changes when going from 29” wheels to 27.5+. The tires the frame was designed around require the wheel to be pulled back 12.5mm when running 27.5+ tires (with 50mm rims) which increases the wheel base about 12.5mm. Not a huge difference but not entirely negligible either. Thanks to Slippers for that liberal schmear of information. That about wraps it upon this end, we have to get downstairs to the big Frostbike dealer trade show and talk about how best to get things to you. If you have questions, you can always get us at derby@surlybikes.com or any of the other various means. Talk to your shop about price as it will vary by country - it won't deviate too much from the current. We should have them in stock in the US by the end of April.